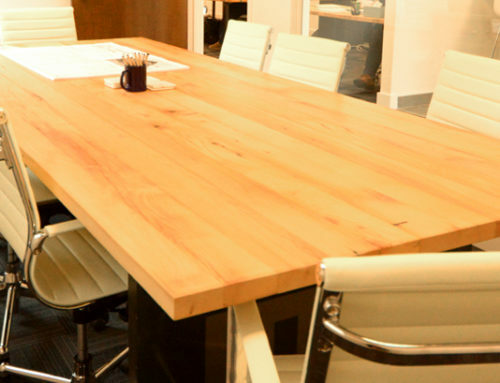 An advantage of owning and operating a reclaimed lumber millshop is that we have the opportunity to experiment with the wood in our own homes. 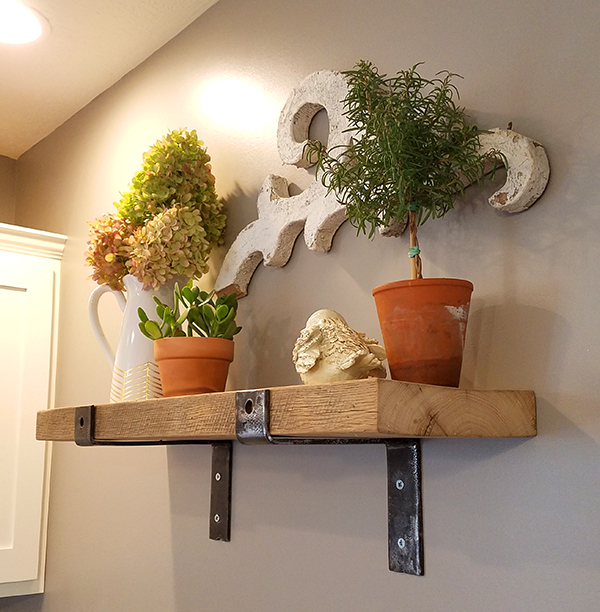 This reclaimed plank shelving is easy to install and available in different sizes and textures along with the custom designed steel brackets. We have a few sizes in stock which are available to view and pick up at our shop in Covington, Ohio or we can custom fabricate different options just for you. 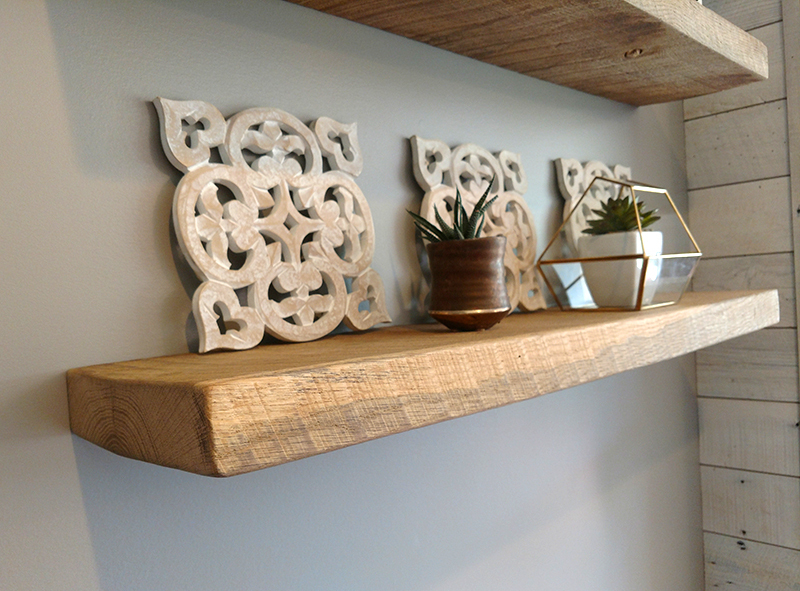 Floating shelves are becoming popular as there are no visible brackets and the reclaimed wood adds an extra special touch. 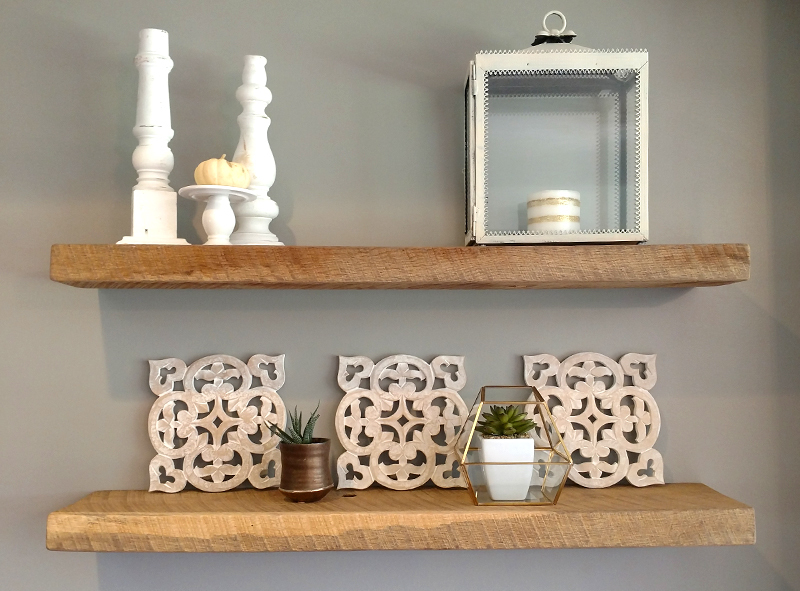 The original rough sawn texture remains on the 2” thick shelving shown below. This type of shelf is mounted with a steel bracket which is screwed into the studs and the shelf then slips over. 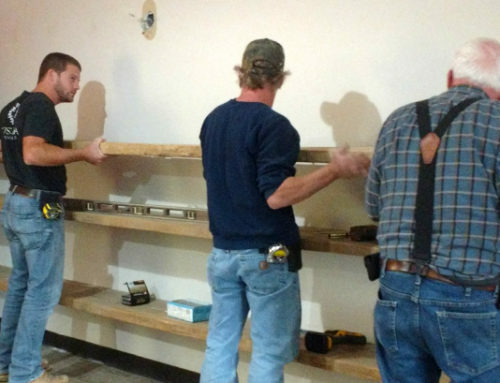 The bracket is predrilled into the shelf at our shop so, once in the home, all the customer has to do is level and fasten the bracket with a couple of screws and slide the shelf into place. Different sizes and textures are available for the floating shelving as well. 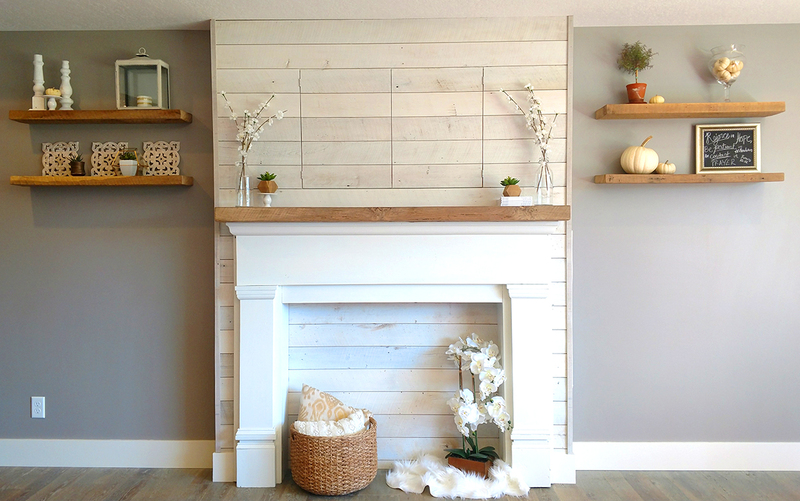 This faux fireplace uses all reclaimed wood materials and includes a couple hidden surprises. 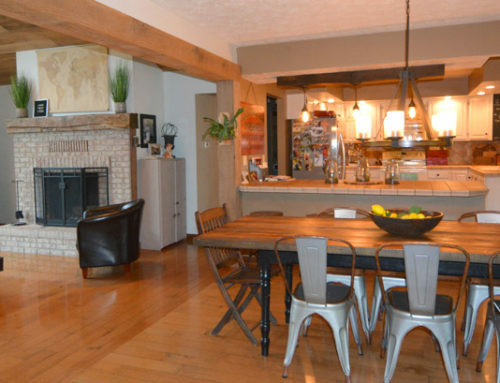 This particular fireplace mantel was found in an old barn which we refinished and then fastened a reclaimed oak plank on the top. 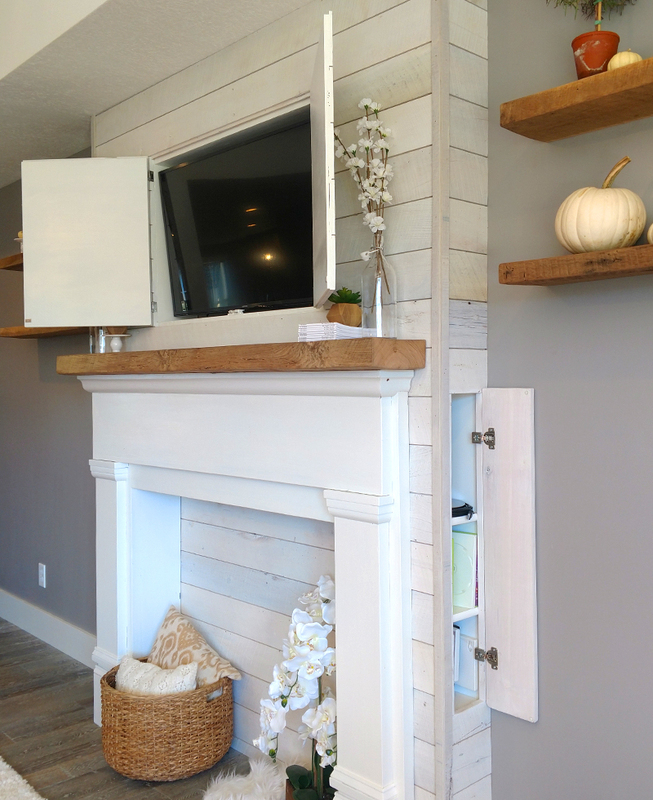 The back wall is reclaimed shiplap planking given a white wash finish. 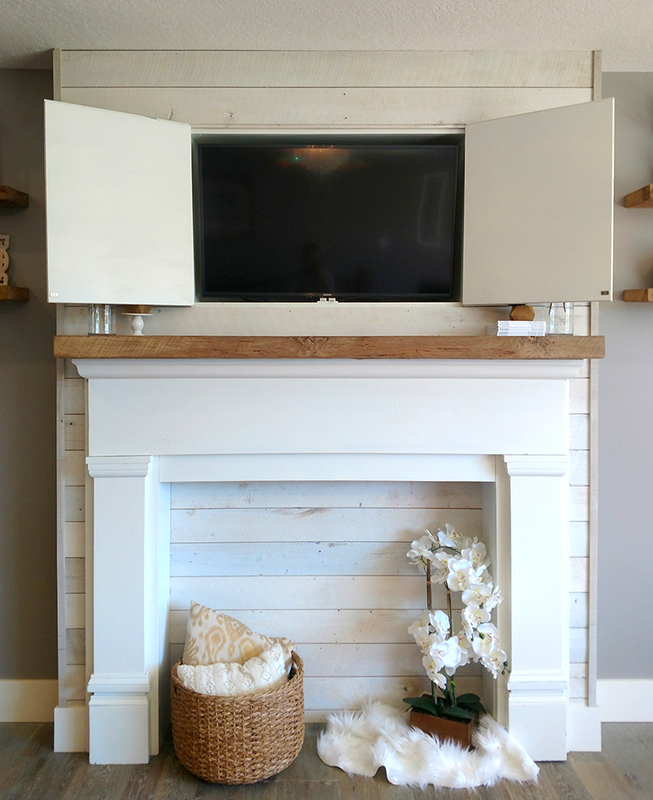 The original idea was to mount a TV screen above the mantel, but we also wanted to retain a more elegant look at times by just showing the shiplap planking. This was accomplished by running the boards all the way across and making two doors which would allow the TV screen to be hidden when not in use. There was also a hidden access door built into the side of the fireplace to house all the components. 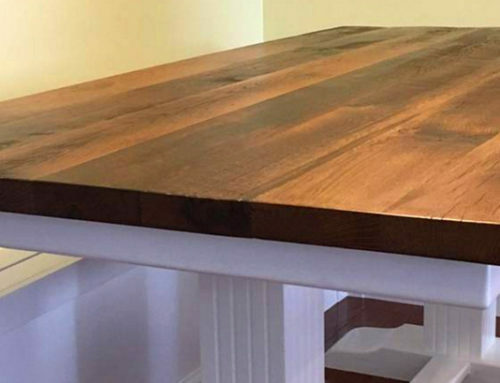 Reclaimed wood can be reused in so many beautiful and creative ways. 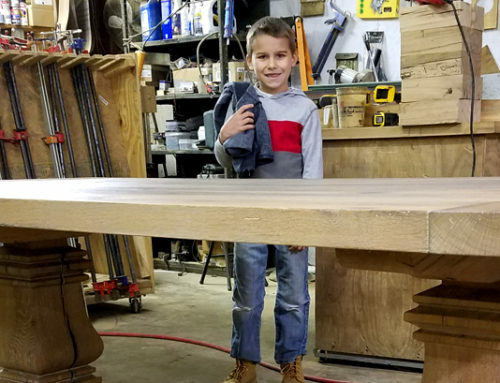 If you have a unique idea for your home and need some help to mill, fabricate and install the reclaimed wood, contact us today, we’d love to help!